In this project, the client asked ADT to perform a hydrodynamic design optimization of a strongly interacting diffuser pump stage using the inverse design code TURBOdesign1. The focus of the design was to minimize the hydrodynamic loss generation, particularly in the diffuser channels. Figure 1 below shows the pump diffuser arrangement. The project was divided into several tasks. Initially, a detailed flow analysis of the existing pump diffuser was performed. Due to the strong interaction between the impeller and the diffuser blade rows, ADT performed a full stage unsteady flow analysis in order to understand the flow structure and loss generation mechanism in the machine. Based on the analysis study, the majority of loss generation occurred in the diffuser channel. A redesign of the impeller blades was performed using TURBOdesign1 to minimize the secondary flow losses in the impeller and reach an uniform flow condition at the impeller exit and diffuser inlet. Unsteady flow analysis confirmed that the new impeller had a higher efficiency and also resulted in more circumstantially and axially uniform exit flow distribution. The diffuser redesign was followed by prescribing a modified thickness and loading distribution in the inverse design code TURBOdesign1 so that an optimised flow in the diffuser channel was obtained. Unsteady flow analysis in the pump stage was then performed using the redesigned impeller and diffuser blades. The results showed up to 4 points improvement in stage efficiency was obtained in the redesign configuration. Flow details comparison show an optimised flow field in the diffuser, see Fig. 2 and 3. 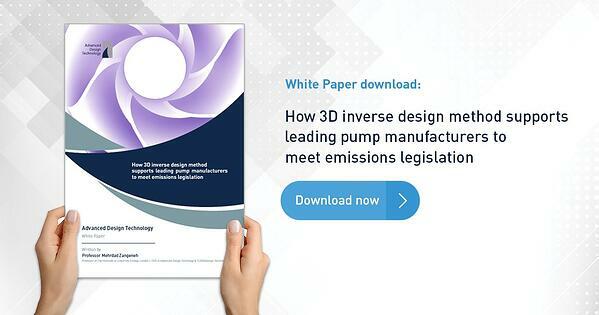 Learn how to meet the emission legislation and improve your pump performance efficiency by up to 4 points. Get your free white paper now. Would you like to discuss your current pump design software and design strategy? Get in touch now and learn how you can optimize your blade loading and pump design process.